My name is Jannine Hewitt. I live in Stockport and make and wear vintage-style clothing items. I also have an A level in Art & Design. I just love to furnish my home with vintage items. I didn't know who Harry Gregg was but the stall holder told me he was the goalkeeper who survived the Munich air disaster and went on to play again three weeks after! Selection of vintage suitcases and trunks, £50.00 - £55.00 from Lime Street Trading. Handmade peg dolls £5.00, and peg doll cards £2.00 or three for £5.00, from Ophelia Button’s Emporium. “Ghanga” comes from the stall holder Mick’s granddaughter's mispronunciation of Grandpa! He says he was a psychologist at a university and has collected these items himself. 1950s Pifco Princess hairdryer - unused and boxed, £20.00 from Bluecat Jewellery. Eric Hewitt in a blazer and boater from Empire's Ghosts. 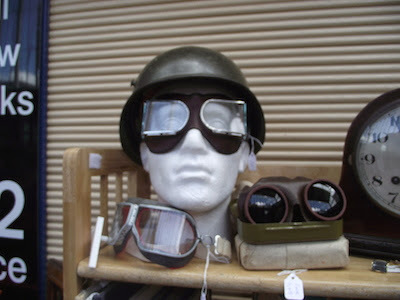 German paratrooper helmet and goggles, £28.00, and goggles £30.00, from Vintage Whatnots. Our thanks to Jannine for her unique and personal take on our D-Day fair! Charming, battery operated vintage toy in its original box. This was originally 22 shillings (one pound, two shillings). The stall holder says a lady buys them at Christmas to put in the pudding as a gift to friends. They are all lucky in a different way and all individual. For example, an elephant symbolises a year to remember, and the boot is for good luck. I couldn't resist the gypsy caravan and bought it! 1950s pink cotton summer dress with embroidered bodice, £40.00 from Grandma's Attic. Chuck Berry ‘The Latest and the Greatest’ album, £15.00, from Wax Delirium. Early 20th century striped public school blazer with bullion embroidered badge, £100.00, from Empire’s Ghosts. Cottage ware set, £24.00 from Aspidistra Vintage. A rare and unusual item! Pelham Puppets witch in original box, £18.00 from All Our Yesterdays.